Deal 2 damage to your opponent. 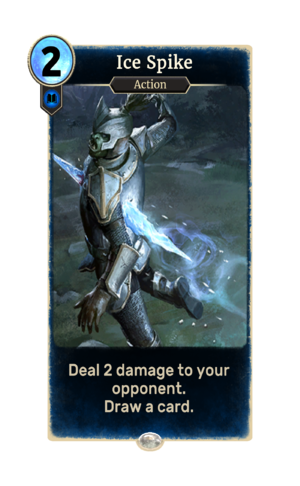 Ice Spike is a common Intelligence action card. It is part of the Core Set. It can be drawn by Ice Wraith's ability. Ice Spike is named for and depicts Skyrim's spell of the same name. This page was last modified on 24 September 2018, at 22:53.